Vitamin Minerals & Herbs- Expertly formulated to support the holistic health needs of men 55+, including healthy mood and brain function, energy support, eye and bone health, and with complementary Aloe for digestive support. IRON FREE. Immune Support- Strengthens healthy immune defenses with clinical-strength Astaxanthin, a rare plant-nutrient from organic algae, and fermented Vitamins C & E.
Heart Health- Rich in fermented Vitamin D3, which research shows may support cardiovascular health, including healthy blood pressure support. 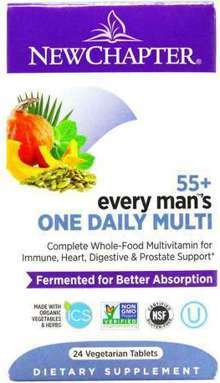 Prostate Support- With fermented Selenium to support a whole-body antioxidant response and support a healthy prostate, and complementary Saw Palmetto.